Wednesday 16th August 2017 by Vane Núñez in Mobile Accessories. We’re happy to show off the very first Galaxy Note 8 cases here at Mobile Fun. 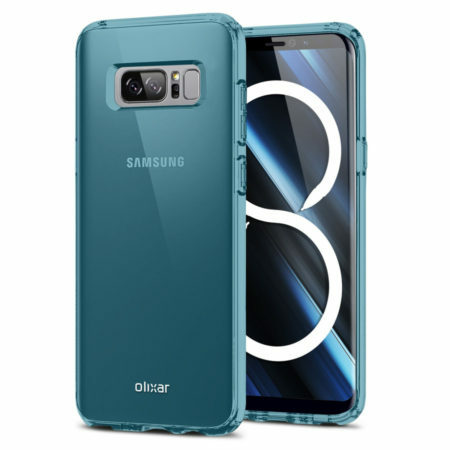 These cases come courtesy of Olixar, who have produced the designs with insider knowledge of the Note 8. Let’s take a look and see what we can glean from the designs, and take a closer look at the cases themselves! The FlexiShield Gel Case shown above is one of the most popular cases we stock, and we expect no difference for the Galaxy Note 8. The case is made from a flexible gel material (go figure) that is easy to install and remove, while also adding minimal bulk to the Note 8. The case is available in a range of colours, from the blue shown above to purple, solid black and a 100% clear variant. The press photo shown above is only one of two designs that Olixar have announced for the Galaxy S8 thus far. The other is the Olixar X-Duo, a more protective case that combines a carbon fibre rear cover with a metallic bumper. This case hits a higher price point, but delivers more style and improved armour. 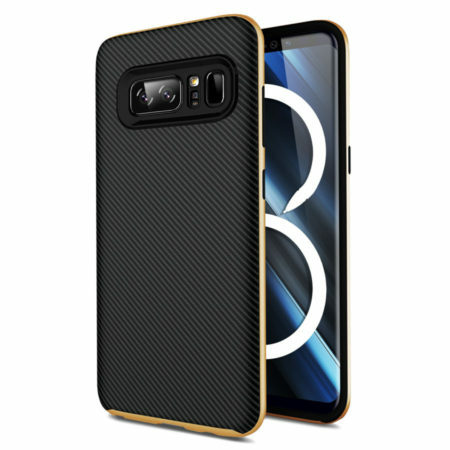 The X-Duo case will be available for the Note 8 in gold, jet black, metallic grey and silver.